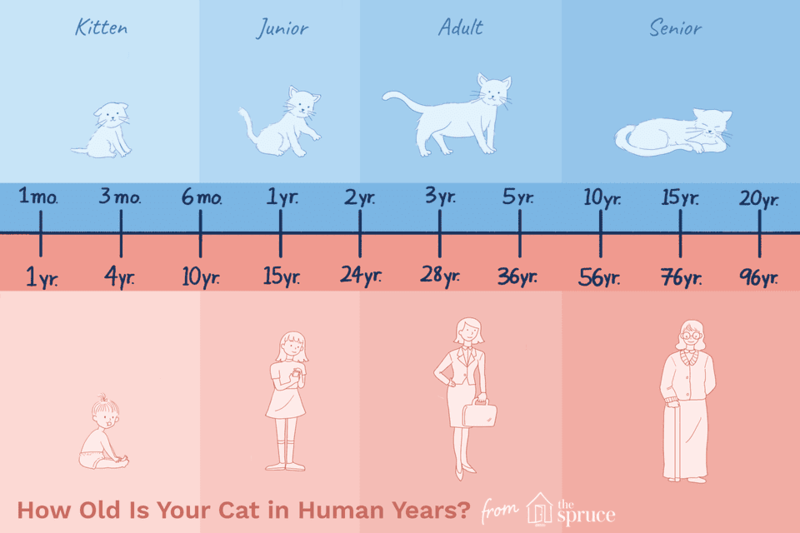 Historically, people often think every year of a cat's life is equivalent to seven years of a human's life, but cats actually age must faster than that. And with age, we know that diseases often follow, but cats also act differently at certain life stages. Because of these things, it's not only helpful, but also important to be able to understand what your cat is going through at each stage of life. The first six months of a kitten's life are filled with eye-opening experiences—literally. A kitten's eyes and ears open shortly after birth at around two to three weeks of age, and from there its physical and mental development takes off. A kitten is exposed to sights, sounds, and smells just like that of a human infant. Each new animal, person, and object it comes in contact with helps to form its personality. Over the course of the next few weeks, the socialization skills of a kitten are greatly affected depending on all of these interactions and exposures. After a kitten leaves its mother at about two to three months of age, it will start to become more independent and curious. It will explore its surroundings, get into a little trouble, and potentially chew on things it shouldn't chew while its adult teeth are starting to erupt. Growth happens fast during these months and by the time a kitten is six months old, they are comparable to a 10-year-old child in age. A series of vaccinations will need to be performed and kittens are typically spayed or neutered around six months of age. Most hereditary or congenital issues are usually discovered by your veterinarian during this time, if there are any at all. 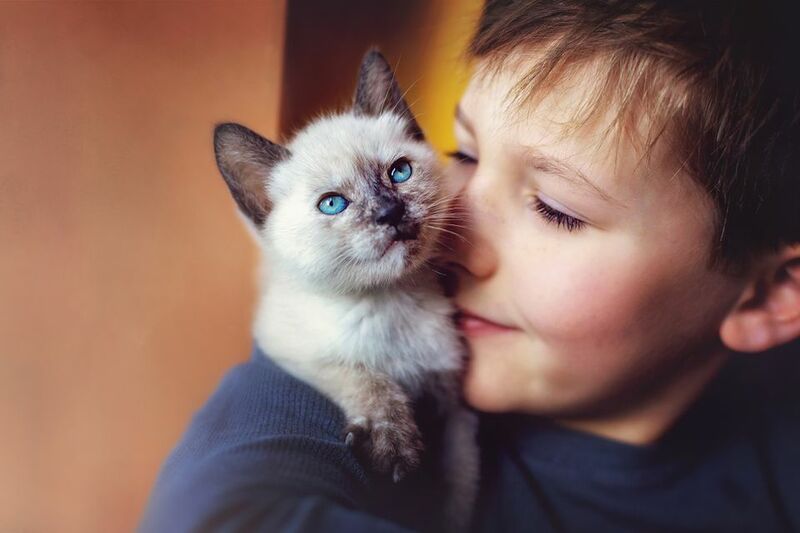 Since a six-month-old kitten is already comparable to a double-digit human child, older kittens and younger adult cats will be continue to test their boundaries as they grow into adults. By the time your cat is one year old, it will have reached its adult size and its preferences, habits, etc. are typically established. A cat that has reached one year of age is considered an adult. Adult cats don't need as many vaccinations as a kitten needs and are usually healthy, but this age period is a good time to get some baseline blood work performed to know what your cat's normal values look like. You'll thank yourself when your cat is older and you have something to compare its blood work to. Occasional grooming, dental cleanings, and annual check-ups with a veterinarian are typically all that are necessary to keep a young adult cat healthy. A three to six-year-old cat is still an adult but not a senior cat yet. These years are usually trouble-free in regards to health concerns but some cats do have chronic health issues or congenital concerns that need to be addressed. A prime cat may benefit from early joint support supplements to keep its hips and knees working as they should, will need annual vet check-ups with regular vaccinations, and may experience an occasional health concern, but overall this age period is usually a healthy one. A five-year-old cat is comparable to a human in their mid-30s, so these are its prime years as an adult. Once your cat reaches about seven or eight years of age, some veterinarians may start referring to it as a senior, but we know that since cats typically live into their late teens, they're not yet senior citizens. While cats who are nine or ten years of age might have been eligible for an AARP card if they were humans, they haven't quite reached retirement age yet. This is an important age period to ensure your aging cat is getting proper nutrition, hasn't developed dental disease, kidney issues, or a heart murmur, and is still able to jump on and off things easily. Blood work should be compared to that which was done during the younger years to ensure there are no trending changes in organ function and more frequent check-ups with your veterinarian are recommended. Your cat is finally a true senior when they reach eleven years of age. Joint issues are a commonly hidden concern that owners of aging cats should be addressing and organ functionality may start to decrease. Blood work should be monitored at the recommendation of your veterinarian to ensure common problems seen in senior cats are caught early. Dietary changes may also be recommended at this age, since older cats typically need different nutrition as their bodies change. Some older cats seem to get crabby as they age, but this is often simply because a senior cat may be experiencing pain or joint discomfort or even brain changes and confusion. Be sure to discuss any observed changes with your veterinarian, as it may be an indicator of something else going on with your cat. Cats live a long time. A 15-year-old cat is comparable in age to a human in their mid-70s and by the time they are 20, they'd almost be 100 years old if they were a person. Any cat that is 15 or older is considered geriatric and should be visiting the veterinarian at least once every six months. These cats may be on medications or special foods and supplements to support various bodily systems. Geriatric cats often have decreased hearing and vision abilities and sleep for the majority of the day. Cognitive decline is not uncommon in cats of this age, just like a human in their 90s might experience. Signs of cognitive dysfunction in cats include crying at night and urinating or defecating near, but not in, the litter box, among others. While it's more common for a cat to live into its 20s than it is for a dog, a cat this old is still an accomplishment and special attention should definitely be paid to these geriatric felines.